I love Danish open sandwiches and I love Pintxos! The latter being Basque tapas, i.e. 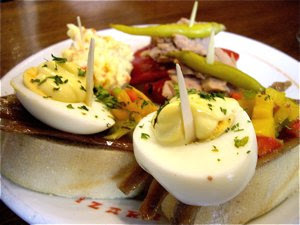 delicacies served on slices of white bread. 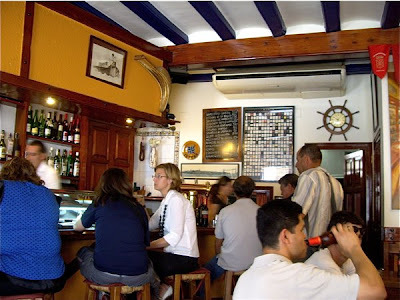 In Sitges we found Izarra, a place favoured by the locals. Here we were served delicious pintxos, but - they could never compete with those served at Bilbao Berria in Barcelona. For those of you that have not enjoyed a pintxo, you are recommended to do so. 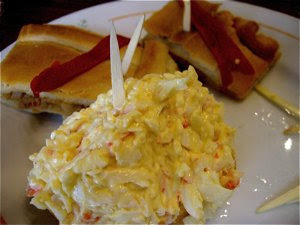 The basques love rich ingredients as mayonnaise and salads based on mayonnaise. As these delicious ingredients in abundance pinned to a slice of white bread, slices of delicious salted anchovis topped with hard boiled eggs and mayonnaise. Contrasts - the mild richness of the eggs and the strong salt fish! Yum! 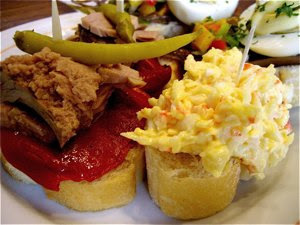 Another personal favourite is the pintxo with baked red peppers and tuna salad. I have enjoyed this variety at Bilbao Berria. When preparing tapas for my good friend Ketils 50th anniversary September 2007, this was one of the pintxos I prepared for his buffet. The sweetness of the red pepper and the mild tuna, mayonnaise salad is unbeatable - a winner!!! Here is another mayonnaise based salad, made with hard boiled eggs and crayfish tails in large quantities. Sinful, greasy goodness, a mild and tasty combination. In the background a rather atypical pintxo, a variation of the tapas above. Short crust pastry filled with tuna salad and garnished with roasted peppers. 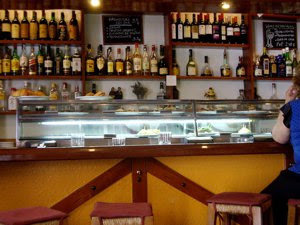 Izarra is definitely a good place for a rendez-vous with a pintxo or four. The small room is packed with people, most Spanish - young and old gather to eat, drink and talk. The prices are very agreeable, no tourist rip-off to eat at Izarro.